The Washington Capitals' 4-3 victory over the Vegas Golden Knights put Twitter in a playful mood, prompting many users to jokingly accuse Russia of 'meddling' to secure the hockey championship victory. 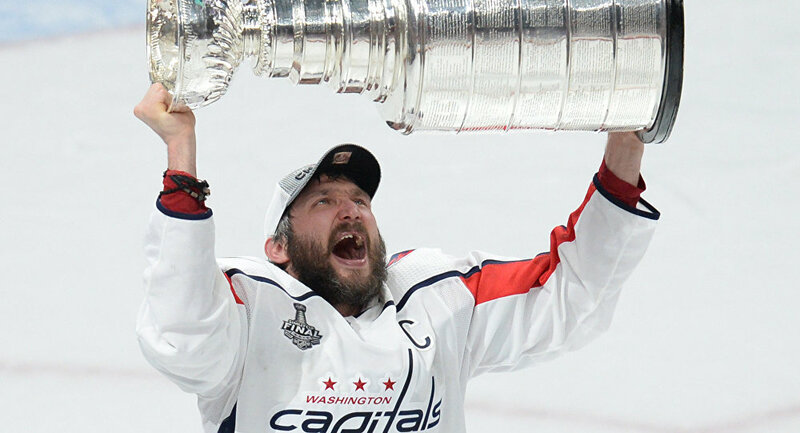 Social media had a field day joking about "Russian interference" in Thursday's Stanley Cup final, pointing to Captain Alex Ovechkin's contribution, as well as that of the team's two other Russian players Dmitri Orlov and Evgeni Kuznetsov. — Jonnie Nonnie (@NonnieJonnie) 8 июня 2018 г. — John Gilmore (@macgilmo) 8 июня 2018 г. — Sports News (@ChiTownSportsss) 8 июня 2018 г. — khal drogo (@apoll0h) 8 июня 2018 г. Some users also had some suggestions (some more serious than others) about where the Cup will be traveling now that the Capitals and their Russian star player have won it. Ovechkin is about to throw a Stanley Cup party and all of Russia is invited. Ivan Drago is bartending. Putin is the DJ. Maria Sharapova will provide entertainment by lighting vodka-soaked tennis balls on fire and hitting random objects off the top of people’s heads. — Nick Early (@Nurly13) 8 июня 2018 г.
Alex Ovechkin’s bender will last til October, and will most definitely include him leading the Stanley Cuo parade riding a Siberian Tiger while wearing only a cape and wielding a sword. The crowd will be bigger than at the inauguration, and will involve almost as many Russians. — phonymahoney (@phoneymahoney) 8 июня 2018 г. That Stanley cup is going to have a hell of a time in Russia. The thing might not make it back alive! — Jason Crawford (@JCraw4991) 8 июня 2018 г.
Ovechkin and Putin posing with the Stanley Cup in Khmeimim airbase. Make this happen, @mfa_russia. — Serge (@Zinvor) 8 июня 2018 г. The jubilant mood was intensified after President Trump tweeted his congratulations to the Capitals for their win, and his special shout out to Ovechkin, whom he called "spectacular" and "a true Superstar!" Some of Trump's detractors joylessly suggested that it was a real conspiracy, with others laughing it off. A known acquaintance of Putin too. — Tim Campbell (@VncentLIFE) 8 июня 2018 г. Always praising the Russians. You are unbelievable! — The Commander ✊🏼🌊 (@ChocaholicBrit) 8 июня 2018 г. Please invite Putin to congratulate him when he visits the WH. It will pop the heads of all the fake news people at CNN and MSNBC. — Over It (@nflnomo) 8 июня 2018 г.
Lol there it is folks! Trump complements the Russian team captain all to please Putin. Yep, you got him! Call Mueller immediately! He must know! — Decapped (@DecappedNews) 8 июня 2018 г. The Capitals fought their way to the Stanley Cup against the Vegas Golden Knights in Las Vegas on Thursday, with Ovechkin becoming the first-ever Russian-born captain to win a Cup. Setting a Caps record with a league-high 15 goals, including one in the final game, Ovechkin has been awarded the Conn Smythe Trophy as most valuable player in the playoffs.